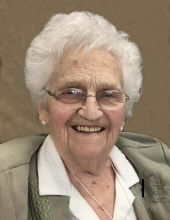 Mary M. Steimel, 85, of Eagle Center, died Sunday, November 11 at the Cedar Valley Hospice Home. She was born September 30, 1933 in Jesup, daughter of Fred and Eva Etringer Meier. She married Melvin W. Steimel on September 30, 1953 at Immaculate Conception Catholic Church in Gilbertville. He died July 24, 2013. Mary was a farm wife and was also employed with Covenant Medical Center, working in the cafeteria. Survivors include: seven daughters, Peggy (Ron) Sole of Randolph, Minn, Patty (Joe) Disch of Davenport, Judy (Gale) Holm of Bellevue, Linda (Leo) Schaefer of Waterloo, Diane (Tim) Brandhorst of Brooklyn, Iowa, Kathy (Bob) Fischels of Dysart and Lisa Headington of Eagle Center; two sons, Ted (Marcia) Steimel Eagle Center, and Leo Steimel of Eagle Center; 24 grandchildren and 36 great-grandchildren; eight siblings, Anna Reuter, Rita Smith, Maxine Schmitz, Fredrick (Stella) Meier, Eva Schmitz, Bernie Meier, Phyllis (Don) Reiter and Kenneth (Moe) Meier and a brother-in-law, Loren Steimel. Preceded in death by: a son, Dennis Steimel; a grandson, Troy Brandhorst; a brother, Joseph Meier; six brothers-in-law, Maurice Reiter, Tom Smith, Jim Schmitz, Bob Schmitz, Lewis Steimel and Ray Fischels and four sisters-in-law, Judy Meier, Winnie Fischels, Arlus Steimel and Ruth Steimel. Services will be 10:30 a.m. Saturday November 17 at St. Mary’s of Mt. Carmel Catholic Church with burial in the church cemetery, all in Eagle Center. Public visitation will be from 3 to 8 p.m. Friday with a 3 p.m. rosary and an 8 p.m. vigil service, all at the church. Visitation will continue at the church for an hour before services on Saturday. To send flowers or a remembrance gift to the family of Mary M. Steimel, please visit our Tribute Store. "Email Address" would like to share the life celebration of Mary M. Steimel. Click on the "link" to go to share a favorite memory or leave a condolence message for the family.